Brandon Fisher is the textbook definition of a Safety Hero. An Army Veteran of 8 years with a majority of his duty spent on the front lines, Brandon chose to become a safety professional after he earned his Associates Degree in Health Sciences and Radiation Technology. 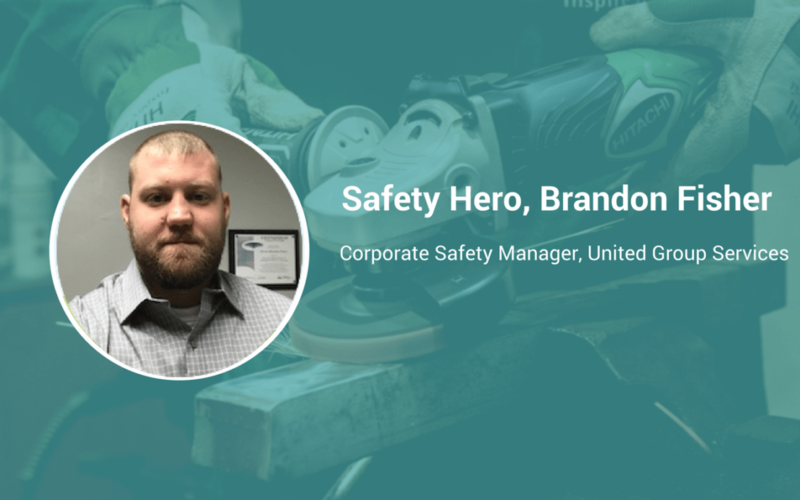 Brandon is described as a caring leader by all those he works with, and his commitment to behavior-based safety has propelled his career growth. Currently, Brandon serves as the Corporate Safety Manager for United Group Services. After returning from 8 years of active duty, I quickly realized that my skill-set didn’t translate into civilian life and work. I went to school and got my Associate Degree, but still found that my skills weren’t a fit for most of the jobs available to me. A friend of mine knew that I was looking for work, and he introduced me to United-GS where they found that my military background and health science experience would be perfect for a safety position. You have to be able to communicate with your people, while also enabling them to succeed. Safety personnel are here to help, but we oftentimes are seen as an enforcer looking to punish people – that’s not true. It’s the safety person’s responsibility to communicate what’s important, without it seeming like a punishment. And they have to be able to instill “the courage to care” in their people – that is, the courage to speak up when something isn’t right. We believe that a behavior-based safety approach is the best way to achieve sustainable safety success. Through those smaller incidents, I was able to hone my ability to understand root-causes to improve our safety program. Grabbing people’s attention to make sure that they understand what’s happening. Fortunately, my Army experience taught me how to do that. I would change the perception of safety people being “enforcers” to them being helpers and guides. Safety personnel have one goal and one responsibility: to help you leave work the same way you walked in. We are here to answer questions, to guide, to teach.